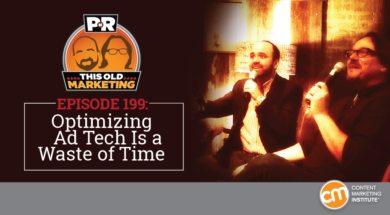 In this pre-Content Marketing World episode, Robert muses on time and the waypoints we choose to mark it. In the news, we discuss the possibility of Google buying Marketo, and why the big money will continue to go to marketing tech rather than advertising tech. Trade Desk tries to fight the ad fraud battle, which we believe is one big waste of time. Our rants and raves include Rob Scallon and Taylor Swift; then we wrap up with an example of the week on Warsaw, Indiana. CoSchedule is the No. 1 Marketing Calendar for everything you need organized. Get a bird’s-eye view of all your content and social promotion efforts. You can organize your content and build a consistent schedule, enabling you to publish faster and more often! CoSchedule’s workflow management tools will keep everyone on the same page with clear directives – you’ll never wonder “who’s doing what” or “where you are” in a project. It’s also ideal for social promotion: By enabling you to create all your social in one place, you can focus your efforts on quality messaging, and stop spending your valuable time jumping from one tool to the next! Here’s an exclusive deal for PNR podcast listeners: Try CoSchedule free for 21 days! (00:22): Robert muses on this week’s theme: Do we choose our own waypoints, or do they choose us? (07:29): Your guide to producing better work together: We’ve found that creative content production at most organizations falls into five core steps: strategic planning, tactical planning, creation, deployment, and assessment. Where are your teams getting stuck? 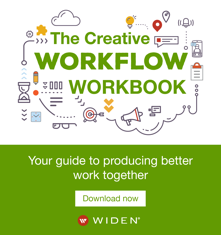 Download the Creative Workflow Workbook to find out. 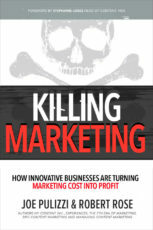 (16:10): Special offer for our new book, Killing Marketing: Pre-order or purchase Killing Marketing and send your receipt to contest@zsquaredmedia.com for a chance to receive a free copy of the audiobook version. (40:10): Joe’s rave: With music on my mind this week, I happened to come across the YouTube site of my old friend Rob Scallon, who specializes in playing 8- and 9-string guitars. When we first met, he was searching for a way to make a living from his music that didn’t require nonstop touring. Fast-forward two years, and today, he’s managed to accomplish all his goals by building a loyal audience of fans who are willing to pay for exclusive access to his content. I see no reason why any other company out there can’t do the same. (44:10): Robert’s rave/commentary: Taylor Swift dropped her new single this week; but this isn’t the only content her fans will likely be snapping up. As reported in MediaPost, Swift is promoting the song, and her upcoming album, by publishing two limited-edition collectible magazines through a partnership with Target. The magazines will feature original poetry, photography, and artwork created by Swift. But what Robert feels is particularly interesting is that this effort comes on the heels of a deal Swift made with Ticketmaster’s Boost program, which requires fans to achieve a level of fandom on Boost before they can purchase tickets to her concerts. (51:27): Warsaw, Indiana: Good friend and frequent CMWorld speaker Andrew Davis wrote a new business marketing book, called Town Inc. In it, he shares the remarkable example of a small town in Indiana, called Warsaw. In the late 1800s, the city became the site of the first orthopedic device manufacturer. Upon recognizing the many contributions the orthopedics industry had made to the local economy over the years, the city created a nonprofit organization in 2009 called OrthoWorx as a way to share information that would attract more businesses and specialized talent to the area and establish Warsaw as a hub for the orthopedics industry. Today, if you visit the OrthoWorx Indiana website, you can see how well the group’s content initiatives worked, as Warsaw is now the anchor of an industry cluster that represents 50% of the global orthopedic market for total joint replacements, making it the official Orthopedic Capital of the World.